A power outage may occur during an ice/snow storm, hurricane, tornado or flood or may simply be caused by work being done on electric lines. 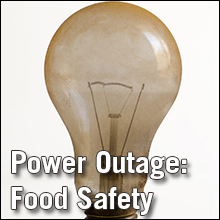 Whatever the cause, the following recommendations apply to food safety in power outages. Use a Thermometer: Keep an appliance thermometer in the refrigerator and freezer at all times to see if food is being stored at safe temperatures (34 to 40°F for the refrigerator; 0°F or below for the freezer). Temperature is critical to the safety of foods in the refrigerator and freezer. Most foodborne illnesses are caused by bacteria that multiply rapidly at temperatures above 40°F. Leave the Freezer Door Closed: A full freezer should keep food safe about two days; a half-full freezer, about a day. If freezer is not full, group packages together quickly. Group meat and poultry to one side or place on separate trays to keep their juices from contaminating other foods if they thaw. Then avoid opening the freezer door to prevent the cold air from escaping. Add bags of ice or dry ice to the freezer if it appears the power will be off for an extended time. Use three pounds of dry ice per cubic foot of freezer space. The temperature of dry ice is -216°F, so use rubber gloves or tongs when handling it. Wrap dry ice in brown paper for longer storage, and separate it from direct food contact with a piece of cardboard. Fill a partially empty freezer with crumpled newspaper to cut down on air currents which cause dry ice to dissipate. Provide adequate ventilation for carbon dioxide in areas where dry ice is used. Do not cover air vent openings of freezer. Refrigerated Items: These foods should be safe as long as the power is out no more than four to six hours. Discard any perishable food that has been above 40°F for two hours or more and any food with an unusual odor, color or texture. Leave the door closed; every time it is opened, cold air escapes and causes the foods inside to warm to unsafe temperatures. If it appears the power will be off more than six hours, transfer refrigerated perishable foods to an insulated cooler filled with ice or frozen gel packs. Keep a thermometer in the cooler to be sure the food stays at 40°F or below. Never Taste Food to Determine Its Safety: Some foods may look and smell fine. However, if they have been at room temperature longer than two hours, bacteria that cause foodborne illness can begin to multiply very rapidly. Some bacteria produce toxins which are not destroyed by cooking and can cause illness. Use the following chart to decide which foods are safe to eat when the power is restored. Discard: The following foods should be discarded if kept over two hours at above 40°F. Meat, poultry, fish, eggs and egg substitutes - raw or cooked. Discard open mayonnaise, tartar sauce and horseradish if above 50°F for over eight hours. Save: The following foods should keep at room temperature a few days. Still, discard anything that turns moldy or has an unusual odor. Refreeze: Thawed foods that still contain ice crystals may be refrozen. Thawed foods that do not contain ice crystals, but have been kept at 40 °F or below for two days or less, may be cooked, then refrozen or canned. If food has spoiled in a refrigerator or freezer because of a power failure, undesirable odors can develop. To eliminate odors, remove the food and wash the inside of the freezer with one tablespoon of baking soda in a quart of tap water, or with one cup of vinegar in a gallon of tap water. Let the surface dry. If the odor still persists, use activated charcoal. This type of charcoal is extra dry and absorbs odors more quickly than cooking-type charcoal. It can be purchased at a drug store or pet supply store. To use it, unplug the freezer. Put the charcoal in pans or on paper in the bottom of the freezer for several days. If the odor remains, put in new charcoal. When the odor is gone, rinse and dry the inside of the freezer. Turn on the freezer and it is ready for food. When odor gets into the freezer's insulation, write the manufacturer for its suggestions for solving the problem. However, sometimes nothing can be done.